Reading pressure! My Mum quails at the thought that I am a Librarian Who Hasn’t Read the Classics (yes, that’s me! – in stark contrast to Ceridwyn’s love of Austen). …I guess I feel that I don’t always read the right things, which could also be why I try to restrict watching my movie consumption, to span only those that are critically panned. I guess I am trying to be “better”! (more healthy? More wholesome?) At the same time, I share Connie and Hannah’s feelings around not engaging in reading as much as is possible – but I also want to read for pleasure, not just reading something that is good for me? This is a tiny section of our (also small) bookshelves at home – I don’t actually own many books (multiple reasons, including working in interlibrary loans for a long time, having expensive books damaged in a flood, etc.). Like Maya, I have some books just for the tactility and memories they offer – touchstones to a different time. 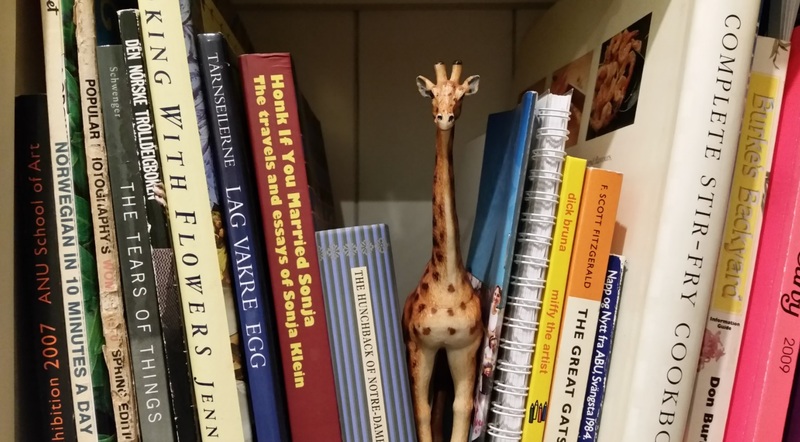 In blogjune 2014, my collection was in a different cabinet – since that time, I’ve bought a few YA series I’ve kept, some books I’ve forwarded on, and received some lovely vegan cookbooks. There are some long-held Christian Boltanski ones that I love dearly, but try not to read/manhandle because I have that hangup of not destroying the pages. I used to work with a curator who purchased photography books as an investment, it seems rewarding – but I think she now buys in multiples (too hard to part with them). Some of the books you see are Norwegian ones – many years ago I thought I would read things in Norsk and at some point my brain would suddenly “click” and just get it. Obvious naivety there. So I really enjoy looking at ideas for becoming bilingual, such as a vocabulary wall. I did a Wiradjuri course last year, which really helped me to understand the mechanics of how I learn, as well as wishing that local languages and culture were embedded in school (but this is changing for the better now). Other books shown are about gardening, art and cooking. I feel like it’s a good topic overview shelf, but it also has other people’s books, so I feel like it also speaks to the work I need to do around boundaries. To balance concerns about not reading, I’ve included a screenshot of a mini-accomplishment – catching up on all the posts in my feedly blogjune category. Yay! I would rather re-read Margaret Atwood’s novels and poetry, than try something super-new. Mr Sonja would say that this also reflects my attitude to “known” foods. There was a well-read books list in blogjune 2014 – I’m afraid I haven’t augmented my score much (read this as: at all) in the intervening 2 years. At the same time of having a guilt trip about what I don’t read, there are some things that are going to be on my “to don’t” list forever. Like Dickens. There are 2 comments - Add yours? I am not going to get on a guilt trip about books unread…life is too short! That list of 100 wonderful, strange and unusual novels is …interesting!! Love this!- I guess I feel that I don’t always read the right things, which could also be why I try to restrict watching my movie consumption, to span only those that are critically panned. I don’t think we have ever even talked movies…another day! Because yes, Dickens is one of those on my ‘to don’t’ list too!